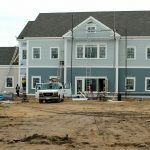 Project Description: Silvia and Silvia is announcing the redevelopment of a property located on 132 Hyannis, MA just west of our own Cape Cod Center. The new project, Lakeside Commons, will be built as a state-of-the-art office building of 18,260 sq. ft. Lakeside Commons will be built as 15,760 sq. ft. of professional office space and a 2,500 sq. ft. bank with 3 drive up windows. The project is located directly on 132 close to exit 6 and next to a traffic light junction. Rte. 132 recently underwent a $10.5 million road improvement project. The building can be subdivided and will be ready in late 2009. The building will feature many green components in order to reflect Silvia & Silvia’s values on conserving energy and environmental sustainability.